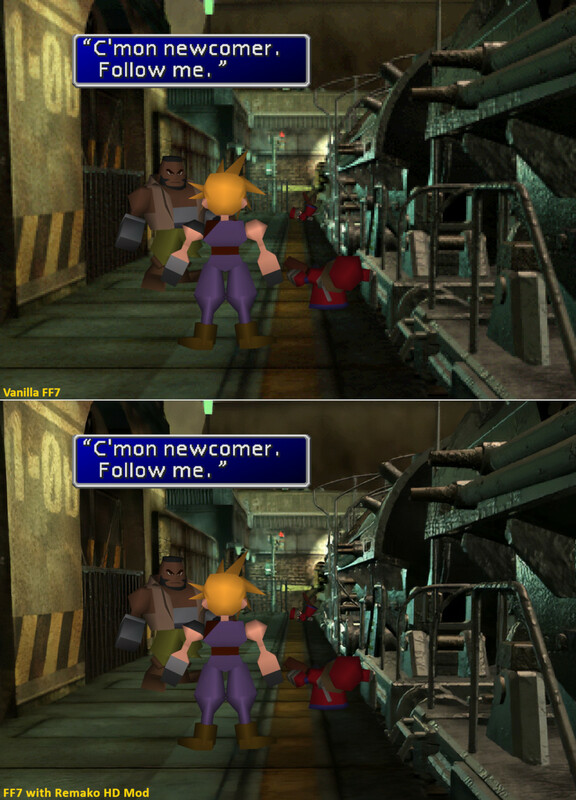 Final Fantasy 7’s CG backgrounds only exist at a low resolution befitting the PS1 era – but fans using AI are hoping to change that. A few months ago we had an article here on VG247 talking about why the problem with porting Final Fantasy 8 to other platforms is with preservation. To cut a long story short, the issue is largely that in the nineties few video game developers were meticulous about holding on to ‘master’ copies of their work. In many cases development tools were deleted and overwritten once a game was completed, the tools then reused for the studio’s next project. That means that when the time comes to up-res or otherwise improve classic games, in some cases it’s a daunting, difficult task. Such was the case for Final Fantasy 7. There was a full year between the announcement of a version of the original FF7 for PS4 and that version’s release despite it being a straight port job – but that was likely for good reason. It probably took Square Enix that long to get a PS4 version of FF7 off the ground. Emulating the PS1 version is an option, but then you’d be left with a low-resolution game stretched in an ugly manner. In the end the version released was hacked and cobbled together from the then-crippled, now-improved PC version of the game. The PC code needed a lot of work, but it was easier than working from the PS1 version. FF7’s backgrounds are gorgeous, but they only exist in a low resolution that upscales poorly. Using the PC build as a base allowed the modern version of FF7 on PS4 and mobile (and soon Xbox One & Switch) to run at higher resolutions. This meant crisp, clean battle scenes (which are rendered entirely in real time 3D) and equally sharp character models out on the field. One aspect of FF7 couldn’t be saved, however – the pre-rendered CG backgrounds. These backgrounds were rendered at a low, PS1 and CD storage-friendly resolution – in some cases as low as 320×240 – and it appears Square didn’t hold on to the original files, so doing a native re-render in higher quality is impossible. For the recent version, Square applied blurring and smearing filters to hide the pixelation when these backgrounds were blown up to modern resolutions. It looked fine, but not great. That was always a shame, as the CG backgrounds are in many ways the lifeblood of FF7, depicting its eclectic, broad world in surprising detail. To make this comparison bigger, give it a click. Zoom in. At full size when opened fully, this image is the width FF7 displays at when at 1080p. Look closely at this image and the difference between the original (top) and remastered (bottom) backgrounds. In particular look at details like the red signal light at the end of the train platform, or the details of the railings behind Barret or on the train itself. These are small improvements that end up adding up to a significant visual overhaul for the game – and all using the original assets. Using machine learning for upscaling images and videos isn’t a new concept, of course. I’ve seen some impressive demos on how the technology is coming along including a great demo of how well the new Nvidia GeForce RTX 2080 Ti graphics cards can handle such tasks – but this is the first time I’ve seen it applied like this to preserving and improving classic older games. It’s usually used for things like rescuing old family photos. In games such upgrades are usually hardware-powered upscales as with the excellent Xbox One X version of Final Fantasy 13 or painstaking hand-made rebuilds of renders or textures, like in the excellent Resident Evil 4 HD Project. In comparison this seems like an incredibly smart alternative method of tackling an upscale HD remaster for a game with hundreds of pre-rendered backgrounds – and in theory it could also be applied frame-by-frame to FF7’s CG video cutscenes, which also don’t exist in higher resolutions. “Traditional upscaling leaves a lot to be desired and manual remodelling takes a lot of time,” mod creator CaptRobau says in the forum thread – and this is a strong, good-looking alternative. The other great aspect of this idea is it allows for a deal of fan interpretation – another modder from the same community is also working on machine learning FF7 upscales with a different algorithm, the end results slightly different. In the near future, fans will hopefully be able to choose between different background mods with different pros and cons depending on what sort of visual fidelity you value. I’m honestly really excited about this. Given that the full Final Fantasy 7 remake is sure to be a very, very different game, preservation of the original classic has never been more vital – and if I were Square Enix, I’d be trying to track these guys down and pick them up to use their methods to upscale and patch the existing console versions of FF7, 8 and 9. That sadly is almost surely a non-starter – but owners of FF7 on PC shouldn’t have long to wait until they can get this crisper, cleaner experience themselves. CaptRobau reckons an initial mod release will be possible “within a week or two” – and seriously, I’m already hovering over that ‘install’ button for FF7 on Steam in anticipation. FF8 next please, fellas?